Childrens novelty apron, pot holder & hat. Aprons have ties, and back side is made from a second fabric choice. Neck supports are stuffed with polyester fiberfill and have appliquéd faces. Lined purses have pieced front and backs with fleece between fabric and lining. Views A and B have zipper opening and detachable straps. Views B and C have machine quilting on upper bands. View C has tabs with magnetic loop closure. Out Of Print Who can resist cupcakes with their coffee or tea? These appliquéd cozies have insulated fleece to keep your beverages nice and warm. View A Tea Cozy has bound seams and bottom edge. Back of cozy is machine quilted. View B Cup Cozy slips over bottom of beverage container and has a small pocket. View C Mug Cozy closes with a VELCRO® tab to slip around your favorite mug. These cozies are designed for lightweight woven fabrics such as cotton/cotton types. Insulated fleece such as The Warm™ Company Insul-Bright® or Pellon® 975 Insul-Fleece® fleece. Out Of Print Girls swimsuit & wrap designed for two-way stretch fabric with 75% stretch across the grain. Empire waist top designed for fabric with 35% stretch across the grain. Out Of Print E-reader cover and case. Cover fits an e-reader 5" x 7 1/2" (12.5 cm x 19 cm) and pre-cuts (fat eighths) may be used. Instructions are included for adjusting for different size e-readers. Out Of Print Whimsical lunch bags make lunch and snack-time fun! Out of print. 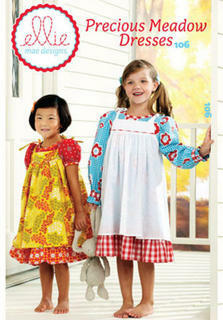 Nautical style dress and short-alls have a V-neckline with a pin-tuck inset, a wide collar with trim, and a ribbon bow. Dress has skirt gathered to yokes on front and back, short gathered sleeves with cuffs, and center back button closure. Bloomers have decorative trim and elastic in casings at waist and on legs. Short-alls have patch pockets on front, short sleeves, center back button placket, and snaps on inside legs. Lined hat has a six panel crown, wide fold up brim with topstitiching detail and purchased appliqués. Out of print. Felt food has the ingredients to make sandwiches and burgers. Items include mustard, ketchup, mayo, lettuce, American cheese, ham, peanut butter, jelly, Swiss cheese, tomato, bologna, provolone, onion, nachos, burger, bread and bun. Lunch bag has contrast sides/handle and flap with hook & loop closure. Suggested Fabrics: Play Food and Lunch Bag: Felt. Lunch Bag Contrast: Cotton, Cotton Types. Out of print Girls Capes DESIGNED FOR LIGHT TO MEDIUM WEIGHT FABRICS. Suggested Fabrics: Minky, Fleece, Sweatshirt Fleece. Cape DESIGNED FOR MEDIUM TO HEAVYWEIGHT FABRICS. Suggested Fabrics: Fleece, Faux Shearling, Boiled Wool. Out of print Pullover tops have neckline ruffle extending over left shoulder, bound left armhole and right shoulder strap. View A is hip length with double stitched hem. View B is below hip length with bottom ruffle. Ruffles have raw edges. View C shorts and View D pants have elastic waist casing and foldover waist band. Shorts have cuffs with tabs, pants have double stitched hems. FABRICS: Designed for two-way stretch knits only with 75% stretch across the grain. Suggested Fabrics: Cotton/spandex, rayon/spandex. Out of print. Appliquéd aprons have purchased bias binding for ties. View A can be used as a towel. View B has contrast pockets. View C toy holder has front toy pocket and hanger pocket. FABRICS: Designed for lightweight to heavy weight wovens. Suggested Fabrics: Aprons: Terry cloth. View B Pocket: Cotton and cotton types. View C: Ripstop nylon and nylon mesh for toy pocket. Out of print Pullover, V-neck tops have appliqués, long sleeves and VELCRO® back tab closures. Views B and C have purchased bias tape trim. Purchased t-shirts and pants. FABRICS: Designed for lightweight woven fabrics. Suggested Fabrics: Cotton, cotton types.